Dr. Stefanidis’ areas of expertise include the the harvesting of geospatial intelligence from social media feeds, the analysis of digital imagery and video, spatiotemporal information modeling and analysis, and geosensor networks. His current and past research activities include projects funded by NGA, IARPA, NSF, NASA, Draper Lab, USGS, and the European Union. 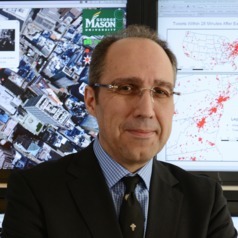 Dr. Stefanidis is the Director of Mason's Center for Geospatial Intelligence. National Technical University of Athens (Greece), Dipl.Eng. The Ohio State University, M.Sc. The Ohio State University , Ph.D.